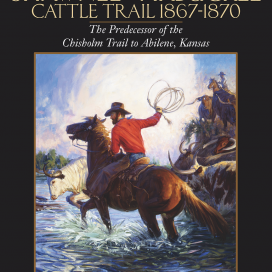 View cart “The Shawnee-Arbuckle Cattle Trail 1867-1870” has been added to your cart. 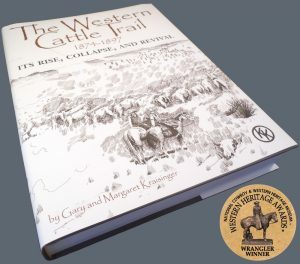 Part I: An explanation of the four cattle trail systems that came north out of Texas from 1846 to 1897: The Shawnee, the Goodnight, the Eastern/Chisholm, and the Western. 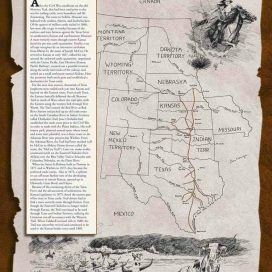 Part II: The Western Cattle Trail in its rise from 1874 to 1885, discussing and showing the trunk line and it’s feeder and splinter routes from south Texas to Canada. 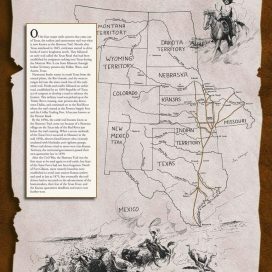 The authors’ some fifty maps are showing routes in Texas, Indian Territory, Kansas, Nebraska, Dakota, Wyoming, and Montana territories. Part III: The Western Cattle Trail in its collapse (1885-1886) and it’s revival to continue trailing cattle north until 1897. After the Kansas quarantine of 1885 and the Nebraska cattle herd law of 1886, Texas drovers created another route through Colorado to deliver their herds into Wyoming and Montana. 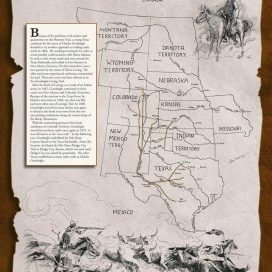 A folded map of the “Texas – Montana Feeder Route to the Western Cattle Trail” will be included with the book.